Home Health Do It For Your Health! I hate working out! Never successfully played a sport in my life! If I’m running, something is chasing me! Despite all of this hatred towards exercise and physical activity, I did a fairly good job of regulating my weight and health after having kids. Mostly due to the fact that my husband is athletic, fit, and loves vegetables. I consumed the balanced family meals he cooked and would do the bare minimum when it came to exercise periodically. That was doing a sufficient job in my eyes of keeping me healthy. However, this all came to a screeching halt as 40 starting knocking on my door. The clock would strike at 8 pm and I was down for the count. My clothes started shrinking. At least three coffee drinks a day was the only way I could be productive. I wasn’t the person I remembered, I was unable to be there for my husband and kids as I should. You could forget about me feeling confident in myself, I hated looking in the mirror and having to get dressed every day. My husband’s concern leads me to call the doctor for an appointment, I figured it couldn’t hurt. I wanted a quick fix, I was looking for some answer that would be the magic change to make me look and feel better. Thankfully, I have a great doctor and she wanted to get to the root of the problem, not just help me cover it up. Sounding just like my husband, she said eat more balanced meals and cut out caffeine. The greatest concern was about my blood pressure, which was running high. With the possibility of having to take blood pressure medicine for the rest of my life, I did as I was told. Tracking my blood pressure became a part of my daily routine. In my follow up appointment, I was discouraged to report that my numbers had still run high for the majority of the readings. The solution- add exercise daily! Those were the words I did not want to hear! I didn’t even want to tell my husband because I knew I was in for it. He would make it his mission to make me sweat! Besides my dislike for activity, there were also the factors of time, money, and convenience. Three things I did not have to spare. Why did it have to come to this? Why couldn’t I have been more proactive before getting to this point and my health is on the line? There was no time to think about the past and what could have been, I needed to focus on the future and the changes I would make. Looking around the house gave me some ideas. Using objects and movements I do every day and making them purposeful gets my heart rate up. Lifting a gallon of water, which weighs eight pounds, a few times makes my arm tired. Why couldn’t I put these movements together and create a total body workout that can be done in my home without having to buy equipment and leave my family? Reaching out to Gina, certified fitness instructor, she assisted in the creation of the original routine confirming that these movements really are strengthening and toning my body. Looking for an additional point of view, we reached out to Mackenzie who is a certified personal trainer and skilled in working one-on-one. She found these movements beneficial as well and provided insight about how to modify them so anyone can be successful. Now all I needed was motivating music to keep me moving. My husband composed original instrumentals of various genres to help me keep the pace up. Although I was getting the exercise part taken care of, I could not overlook the way I was fueling my body. So many times, food was just a filler to me. I was bored, I was sad, I was happy, it didn’t matter the reason I wanted to eat something. I was not thinking of food as fuel. Just like we need to fuel our vehicles, our bodies are more important. Michele Moore, registered dietician, was excited to join our team and provide ways to make eating healthy easy and delicious! She provides practical ways anyone can integrate. Small changes that make a big difference. Working through this program for a little over a year, definitely proved beneficial. A few months after starting 28 minutes a day of faithful and focused activity, my doctor noted my blood pressure returning to the normal range. Each night I would come home drained from the day, but after working through the routine, I was recharged and ready for my responsibilities as a wife and mom. Looking back at pictures, gave me the most encouragement of all. I can see and feel visible changes in myself as well as my confidence returning. Being in my forties does not mean I should begin losing my youthfulness and health. With Home Tone, it is just the beginning with so many new opportunities! I cannot wait for all women in our area to try these movements and see that they really work! The routine is customized with a personal trainer option for those new to exercise and a group workout option for those ready to kick it up a notch. We have even added a Spanish and Mandarin translator to our team to provide voice-overs which will allow us to reach even more women! 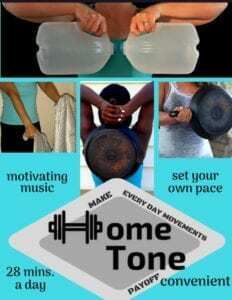 Check out our website: ihometone.com to see my transformation pictures, meet the trainers, see a sample nutrition plan, and purchase your DVD today.